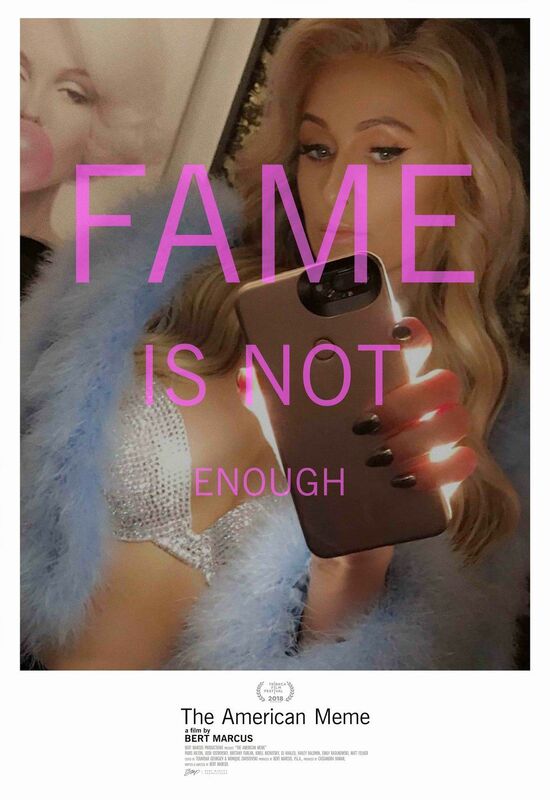 Pop culture ringleader Paris Hilton is the mother of the digital age, having inspired a new generation of self-obsessed social media stars who're wildly famous for being famous. Throughout the heiress' life, she's attracted the world to monitor her every move — her platinum blonde hair flips, her hot pink velour sweatsuits, her famous fleet of chihuahuas — and yet, Hilton didn't do anything to deserve this attention beyond simply being herself. Now, Hilton's invention has multiplied by the millions across the Internet. Everyone's taking selfies and flaunting their lives to an online audience that obsessively follows, likes, and shares. But Hilton did it first — she's the ultimate OG. Director Bert Marcus has recognized Hilton's novelty, and created an entire feature documentary on her impact. The American Meme, which opens tonight at the Tribeca Film Festival, sheds light on how "social media is pervading every inch of our lives," Marcus says, and features names like Hilton, as well as Fat Jew, Emily Ratajkowski and Brittany Furlan to prove his point. "Paris is the OG influencer and helped write the script on how to build a brand through social media," Marcus says. "She's a global icon that is often misunderstood and not typically seen in such a candid, vulnerable light [as in The American Meme]. The social media moguls we herald today are literally following her lead and the tactics she invented years ago, so for me it was an intriguing centerpiece that seems necessary to anchor the film's exploration." PAPER caught up with Hilton to talk about her lasting cultural impact, and the ways she navigates the complex positives and negatives of online fame. Social media has made the world smaller and more connected, but it's also isolated us in many ways. How do you grapple with the pros and cons of its impact? I have always been a huge tech geek and have always been obsessed with technology. Yes, I agree in some way that it has made people more isolated in the fact that people are always on their phones constantly, and no longer have many face to face or even phone conversations and interactions. But I love it because I have a direct line of communication to all my fans around the world and can connect with them. And as a Businesswoman, technology is an amazing marketing tool. Fame has evolved so much throughout your life, and you've always been at the center of it. How do you think fame today differs from fame before the introduction of social media? It has changed in so many ways. Back when I started in this industry almost 2 decades ago, there was no social media and I had no agent, publicist, stylist, manager or anyone. I did this all on my own, I was literally just being me. Soon the press started to call me "famous for being famous," which I think is actually an awesome thing; to be able to create something just by being yourself. I was definitely way before my time. Now today, it is a completely different world. If you have an iPhone and a talent, you can literally film from your own bedroom and create your business, which was not possible before. I love how so many kids' dreams are coming true just with technology and being able to showcase themselves and broadcast it to the world in ways that were not even imaginable back when I started out. "I was definitely way before my time." How do you balance online and offline life? The two are becoming increasingly blurred every day. I love showing my fans my life, but I also keep a balance with it. I love showing special moments and getting to show people places that they might have never been, or incredible memories that I might want to share with the world. But also I have a balance and a private life. Plus, my fiancé Chris has no social media whatsoever, so I try not to be on the phone every second, or else, it's hard to live a real true life when you always have your phone up in the air filming everything. In the early 2000's fame couldn't be tracked by online numbers, it was more of a sociocultural imprint. What do you think about the way our society gauges success with social media following? Social media has become such an important and integral part of our lives. It has become its own currency. I think that it is amazing that people can build a following and make a living and a life, all based off the content they put up, their followers and making a business out of it. As I mentioned earlier, it is a completely new world. People often argue that "famous for being famous" is an empty trajectory, but I believe it's become a viable platform for thrusting change in society. How do you feel you've used this platform to transform the world? I believe it could go either way. When someone is being famous just for being famous for no reason, and they are not using their platform and voice to help with philanthropic causes and changes we need in the world, I feel that it is just a waste. I really applaud and respect the people who have made use of this blessing and opportunity to use their platform to change the world and make a huge difference and impact. There are so many issues going on in the world right now that need to be addressed and changed. I think that it is important that people use their platform in a positive way. "It makes me feel so happy and proud that I could help inspire others and pave the way for a new genre of celebrity." Why do you think our society is so obsessed with celebrities? What do you think is at the core of our social fixation on your life in particular? I think that some people really look up to their idols and also see this inspirational, glamorous lifestyle that people lead and maybe it is an escape for some. I think that it is something to aspire to and also sometimes an escape from reality. You were an OG blueprint for the type of fame that's prevalent today. Do you think you paved the way for modern-day celebrity? How so? Thank you, I have heard that many times before, and it is so flattering and such a huge compliment. It makes me feel so happy and proud that I could help inspire others and pave the way for a new genre of celebrity. Yes I love being the OG, a pioneer and always being ahead of the curve. It makes me feel so happy to hear so many incredible stories and compliments of people telling me how I have inspired them and changed their lives. I am all about wanting everyone to be as successful and happy as can be. I am seeing a lot of that right now and it's beautiful. Do you think there will ever be a point where we abandon social media altogether? What's next? Social media is here to stay. With the new technology and all of the really brilliant minds in the tech world, there are so many exciting projects that I am working on that I cannot wait to share with the world. I am so excited to be launching my new Paris Hilton VR world, it is so innovative and entertaining and will connect people in ways they have never been before, right from their very own home. It will be so revolutionary on so many levels. "In real life, I just like to chill, with my man and my puppies, cooking food and relaxing in my Juicy Couture tracksuit and socks." You're very selective with your projects. Why did you want to be involved in The American Meme? Every single day, my team and I get so many offers from networks, producers and creatives pitching me different shows, movies and other production deals. But with my business empire and traveling 250 days a year, my priorities are more focused on my business so I really don't have the time. But I really trust Bert and his vision. I think he is a brilliant filmmaker and knows how to show an in-depth look into every subject he does a film on. I felt so comfortable showing the world the real me, because there are so many misconceptions out there about me and I have never addressed them, because I did not think that it was worth wasting my time over so many lies and rumors. In this film, I am very vulnerable, honest and real and people will see a side of me they have never seen before. Do you think your online presence is different from your offline presence? You've often discussed how The Simple Life Paris was a character, is there a similar dichotomy with social media? With my online presence, I love to show the world my exciting life. I am always myself and I just love fashion, my pets, my family and my fiancé and that is what I show. In real life, I just like to chill, with my man and my puppies, cooking food and relaxing in my Juicy Couture tracksuit and socks. Yes in The Simple Life, I was playing a character. It was the first of its kind and I had never done anything like this before. The producers wanted me to play this blonde ditzy airhead — and that is what I gave them. I did not realize that this would last for 5 years, but I don't regret a minute of it. I had the best time with my best friend since I was 2 years old, traveling all across America and getting to do all these jobs that I would never have gotten to do. I love how I still meet little kids who still watch The Simple Life now. It is so timeless and iconic. But I wouldn't get this far being a dumb blonde, I was just playing a funny and cute character.